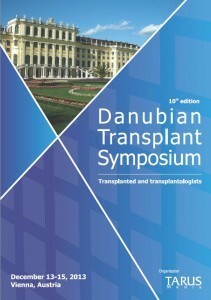 Farmaceutica REMEDIA will attend the 10th edition of the Danubian Transplant Symposium, to take place between 13th and 15th of December, 2013 in Vienna. The event is organized by the Clinical Institute of Urology and Renal Transplantation Cluj Napoca, ROMTRANSPLANT, National Transplant Agency Bucharest, “Dan Setlacec” Center for General Surgery and Liver Transplant, the Insitute of Cardiovascular Disease and Transplant Targu Mures, with the support of TARUS Media. The presentations will be held by personalities with a wide experience in transplantation, like Prof. Dr. Irinel POPESCU, Prof. Dr. Mihai LUCAN or Dr. Victor ZOTA along with anesthesiologists, nephrologists and transplant coordinators from Romania and other European countries. PreviousFarmaceutica REMEDIA participa la cea de-a X-a editie a Danubian Transplant Symposium	NextMagazinul REMEDIA Baby este acum deschis!